Years ago while watching a football game, I heard the announcer talk about Turf Toe as an injury the quarterback suffered. Since then, I have heard a similar statement many times around the sport of football. In our practice, however, we have seen turf toe as an injury in many sports. It is therefore important that any athlete understand what this entity is and how to treat it. What is Turf Toe Anyway? Turf toe is a sprain of the great toe joint and commonly presents as a red, swollen, painful joint. 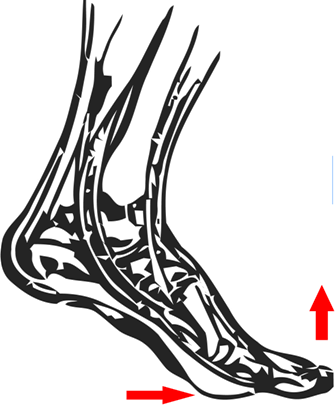 It has long been described as a hyperdorsiflexion (forced upward motion) of the great toe while participating in sports, but can similarly present with a hyperplantarflexion (forced downward motion) of the great toe, like when a toe is tucked under the foot. This condition will present with swelling to the joint and severe pain with any motion of the toe, especially with walking, running or pushing off with the toes. It is a sprain or tear of the ligaments of the 1st metatarsal-phalangeal joint (the great toe joint) and can also include tendonitis or injury to the associated tendons. Care should be exercised to ensure it is only a sprain and not a sesamoid fracture, a stress fracture to the joint or a fracture involving the metatarsal or the toe bones (phalanx). RICE the Sprain - Rest, Ice, Compression, Elevation will improve the swelling in the area and decrease the pain. This treatment is important for any sprained ligament. Splinting- Often the joint is splinted to allow continuation of play after the inital recovery period. Two options exist for splinting. Turf Toe Taping - A specialized taping technique designed to limit motion of the great toe joint and allow healing while still participating in regular activities. This usually reduces the pain associated with the recovery. Orthotic Plate - Rigid plate or possibly a firm extension under the great toe joint to limit motion to that joint. These are commonly place in cleats for football players where the problem recurs regularly and is more a preventive measure as opposed to a treatment option.